﻿ HuntingNut » Forums » Firearms, Shooting & Reloading » Reloading Ammunition » Theories why bullets sting vertically or horizontally? Theories why bullets sting vertically or horizontally? Posted: Sun Feb 28, 2010 7:12 pm Post subject: Theories why bullets sting vertically or horizontally? I shot these groups this weekend at 250 yards. I got pondering why a string would be almost pure verticle or horizontal. I've had this happen once before with a different rifle. I think it shows that a barrel's harmonics can be in the verticle or horizontal direction. Any other theories why this occurs? 250 yards, .270 Win, 130 GMX, 55 grs IMR4350, COAL 3.325", CCI Primers, Remington Brass. 250 yards, .270 Win, 130 GMX, 55,5 grs IMR4350, COAL 3.325", CCI Primers, Remington Brass. Posted: Sun Feb 28, 2010 7:51 pm Post subject: Re: Theories why bullets sting vertically or horizontally? I won't get into the "barrel harmonics" side of things mate...it's way over my head. However, when in the Army we were always taught the vertical stringing was the result of incorrect breathing when preparing to fire the shot. Two things they hammered into us constantly was The Rule of Aim and The Sequence of Firing a Shot, and breathing played a big part in the second of those two. I can't offer a reason for the horizontal stringing except for the usual arguments of trigger control. Posted: Sun Feb 28, 2010 7:58 pm Post subject: Re: Theories why bullets sting vertically or horizontally? What rifle were your shooting? Its a Tikka T3 Lite. It has shot very well with all loads 1 MOA or better with consistent POI. My 150 Berger VLDs shoot vertically also, but tigher at 1/2 MOA. The only difference between these two groups was 0.5 grains of powder. Posted: Sun Feb 28, 2010 9:19 pm Post subject: Re: Theories why bullets sting vertically or horizontally? Horizontal stringing at 250 yards? Most probable causes are wind or cant. Vertical stringing? Most probable cause is velocity variation. Do you have an anti-cant device and do you chronograph your loads? Posted: Sun Feb 28, 2010 9:32 pm Post subject: Re: Theories why bullets sting vertically or horizontally? IMO horizonal strings are due to contact with the stock and barrel. M700's are notorious for this as remington puts a contact bump to put pressure against the barrel at the end of the stock. Posted: Mon Mar 01, 2010 12:54 am Post subject: Re: Theories why bullets sting vertically or horizontally? With a light barrel you might be getting barrel hamonics whipping the barrel in both directions with a change in powder charges. You might be able to tune your loads to exit during the static points of the whip and get nice tight groups without the stringing. Posted: Mon Mar 01, 2010 7:02 am Post subject: Re: Theories why bullets sting vertically or horizontally? Horizontal is usually wind induced but can also be caused by a gun recoiling at an angle instead of straight back. Canting the gun should show some drop in POI and does not affect the accuracy of the group unless different amounts of cant is employed. I see you've stated that the gun usually shoots a MOA or better. It also sounds as if the gun shoots some vertical with whatever you shoot in it. I would caution you as to making any conclusions based upon two 3 shot groups. My advise is to step back and restart your development with the OCW method to see how good the gun can shoot and go from there. Posted: Mon Mar 01, 2010 7:19 am Post subject: Re: Theories why bullets sting vertically or horizontally? Pretty much anytime I have had a previously accurate rifle start stringing it has been due to changes in barrel contact (as DallanC mentioned) or action screw tightness. Horizontal stringing generally indicates pressure on the side of the barrel opposite the direction of the stringing and vertical usually ends up being pressure from under the barrel. Action screws that loosen can cause stringing in any direction. Barrel contact is common in wood stocks that were previously floated if the barrel channel wasn't sealed properly. Wood grain swells from moisture to the point of barrel contact and should be dressed back down and sealed with a good oil, polyurethane or "spar" varnish finish. Posted: Mon Mar 01, 2010 8:20 am Post subject: Re: Theories why bullets sting vertically or horizontally? In this particualr shooting situation, my anti-cant device is ensuring the crosshairs line up with the vertical and horizontal bands that highlight the X,Y axis of the target. I hope to have access to a chronograph in the near future. 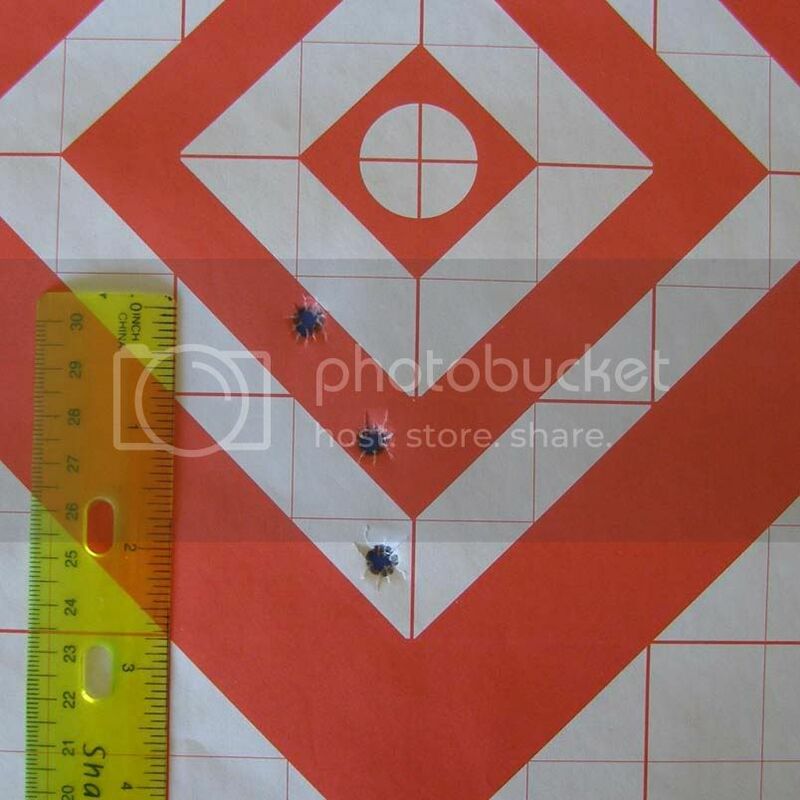 To date, I've dervied velocity once I'm satisfied that I have the load correct by compariing bullet impacts at 100 yards with bullet drop at 250 or greater and using a ballistic calculator. Posted: Mon Mar 01, 2010 8:24 am Post subject: Re: Theories why bullets sting vertically or horizontally? How much charge change would you recommend? 55 grains gave a horizontal string and 55.5 gave the vertical string. Should I try 55.3 or 55.4? Posted: Mon Mar 01, 2010 8:52 am Post subject: Re: Theories why bullets sting vertically or horizontally? Had double sandbags for a rest configuration. I shoot 2 shots then let the barrel cool. I don't wait a specified time because, depending on the air temp for that day, the cool down time will vary. I wait until its cool to the touch. Wind was very light. Same set-up for both groups. The mentor that got me started on reloading had me setting up 5-shot strings every 0.5 grains across the range of min-max powder. I found very quickly that this ate up my supply of bullets and, more importantly, it only took two shots to determine if a load was bad. Yes it takes 5 or more to tell if its the right load to stick with, but a load with no potential can be exposed in only two shots. Thus I came up with my own process for developing a load. I shoot 3-shot groups in 1-grain increments skipping the min and max recommended powder weights. This gives me a quick look at the performance of the bullet-powder combination in 12 to 15 shots. I then look for the sweetspot, and would load five rounds where I think the sweet spot is, then 0.5 above and 0.5 below and fire for affect. I ususally can tune a load in 25 to 30 rounds and still have 20 bullets left to load from the orginal purchase. In this situation, I already have a good load/recipe for a 130gr copper bullet that shoots 0.5MOA, so I did a quick look with this new copper bullet by loading 6 rounds with a powder charge that was 1 and 0.5 grains lower in powder charge. 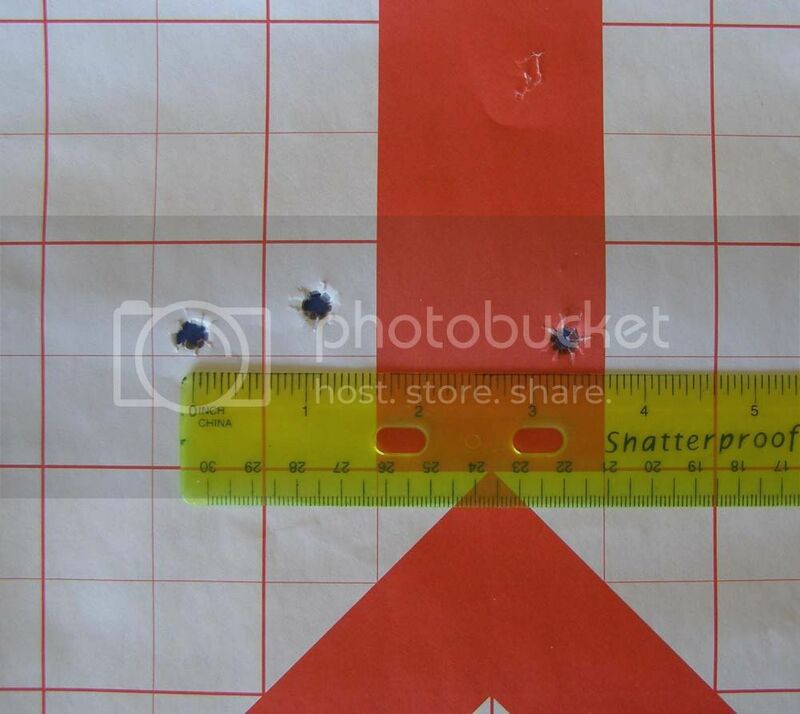 I felt that was a safe approach because the other 130gr bullet, Barnes TSX, had more bands thus less bearing surface so I was anticipating a slightly higher internal pressure with this GMX bullet. Posted: Mon Mar 01, 2010 8:56 am Post subject: Re: Theories why bullets sting vertically or horizontally? Thanks for all the good comments. I found the OCW method chambered221 refered to. Time to do some more studying. Posted: Mon Mar 01, 2010 1:42 pm Post subject: Re: Theories why bullets sting vertically or horizontally? I should have mentioned that the OCW method can be found in the articles section of Hunting Nut......sorry !!! I do link the link you provided though.......it has some info there that I haven't seen. OCW can help limit (time and components) initial load development all while eliminating a lot of the variables. Posted: Wed Mar 03, 2010 8:53 pm Post subject: Re: Theories why bullets sting vertically or horizontally? I spent time digesting the OCW article. Sound like a good way to find the sweetspot. The process I had developed is similar but not as thorough - a coarser look compared to the 0.3gr powder increments OCW uses. I'll try OCW the next time I do load development. In this particualar situation, I don't have enough GMX bullets remaining to do my experiment and also start over with the OCW process. I could buy more but I'm not sure I'm interested in this bullet long-term. This GMX bullet is one of the longest .277 bullets out there but is 20gr less in weight resulting in a very low stability factor for the standard 1:10 twist. I will test and shoot what bullets I have but I ultimately want more stability margin.